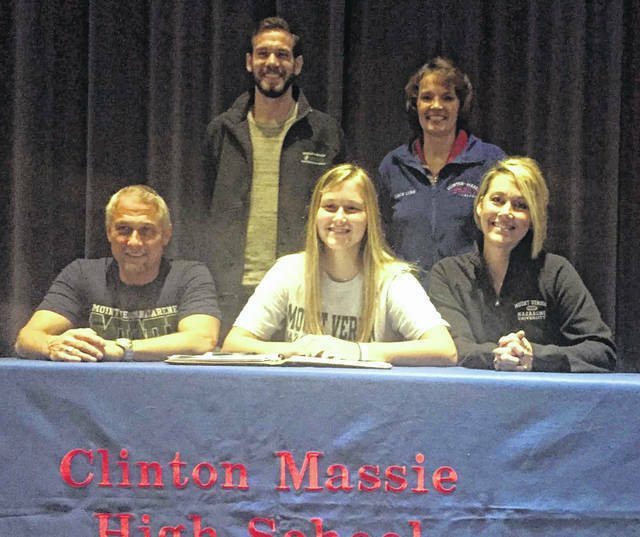 Clinton-Massie senior Hailey Clayborn has committed to play tennis for Mount Vernon Nazarene University. MVNU coach Daniel Doan expects Clayborn to make an immediate impact and appreciates her intelligence, attitude and work ethic, according to a press release from CMHS. Coach Doan was on hand for Clayborn’s signing Thursday. Mount Vernon is a liberal arts NAIA school who competes in the Crossroads League. Clayborn plans to study nursing at MVNU. Clayborn was a four-year varsity tennis starter at Clinton-Massie and three year all-league honoree who graduates in May. She posted a career tennis record of 62-22 to top Clinton-Massie charts. In the photo, from left to right, father Gregg Clayborn, Hailey Clayborn, mother Pam Clayborn; back row, MVNU coach Daniel Doan, Clinton-Massie coach Lynn Deatherage.